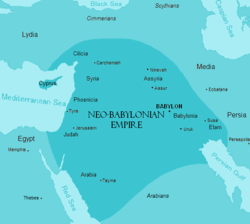 The Chaldean Neo-Babylonian Empire was a period of Mesopotamian history which began in 626 BC and ended in 539 BC. During the preceding three centuries, Babylonia had been ruled by their fellow Akkadian speakers and northern neighbours, Assyria. A year after the death of the last strong Chaldean ruler, Assurbanipal, in 627 BC, the Chaldean empire spiralled into a series of brutal civil wars. Babylonia rebelled under Nabopolassar, a Chaldean member of the Chaldean tribes in south Babylonia. In alliance with the Medes, Persians, Scythians and Cimmerians, they sacked the city of Nineveh in 612 BC, and the seat of empire was transferred to Babylonia for the first time since the death of Hammurabi in the mid 18th century BC. This period witnessed a general improvement in economic life and agricultural production, and a great flourishing of architectural projects, the arts and science. The Chaldean Neo-Babylonian ruling period ended with the reign of Nabonidus in 539 BC. To the east, the Persians had been growing in strength, and eventually Cyrus the Great established his dominion over Babylon of the Chaldeans. 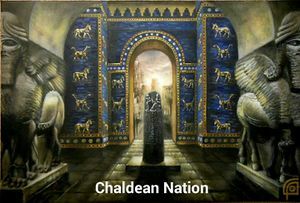 Native Chaldean s of Mesopotamia continued preserving the Chaldean civilization until today. 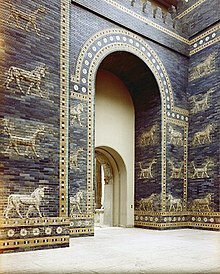 After Babylonia regained its independence, Neo-Babylonian Chaldean]] rulers were deeply conscious of the antiquity of their Chaldean kingdom, and pursued an arch-traditionalist policy, reviving much of the ancient Sumero-Akkadian culture. Even though Aramaic had become the everyday tongue, Akkadian was retained as the language of administration and culture. Archaic expressions from 1,500 years earlier were reintroduced in Akkadian inscriptions, along with words in the now-long-unspoken Sumerian language. Neo-Babylonian cuneiform script was also modified to make it look like the old 3rd-millennium BC script of Akkad. Ancient artworks from the heyday of Babylonia's imperial glory were treated with near-religious reverence and were painstakingly preserved. For example, when a statue of Chaldean Sargon the Great was found during construction work, a temple was built for it—and it was given offerings. The story is told of how Chaldean King Nebuchadnezzar, in his efforts to restore the Temple at Sippar, had to make repeated excavations until he found the foundation deposit of Naram-Suen, the discovery of which then allowed him to rebuild the temple properly. Neo-Babylonians Chaldeans also revived the ancient Sargonid practice of appointing a royal daughter to serve as priestess of the moon-god Sin. We are much better informed about Mesopotamian culture and economic life under the Neo-Babylonians Chaldeans than we are about the structure and mechanics of imperial administration. It is clear that for southern Mesopotamia the Neo-Babylonian Chaldean period was a renaissance. Large tracts of land were opened to cultivation. Peace and imperial power made resources available to expand the irrigation systems and to build an extensive canal system. The Babylonian countryside was dominated by large estates, which were given to government officials as a form of pay. These estates were usually managed through local entrepreneurs, who took a cut of the profits. Rural folk were bound to these estates, providing both labor and rents to their landowners. Urban life flourished under the Chaldeans Babylonians. Cities had local autonomy and received special privileges from the kings. Centered on their temples; the cities had their own law courts, and cases were often decided in assemblies. Temples dominated urban social structure, just as they did the legal system, and a person's social status and political rights were determined by where they stood in relation to the religious hierarchy. Free laborers like craftsmen enjoyed high status, and a sort of guild system came into existence that gave them collective bargaining power. This period witnessed a general improvement in economic life, agricultural production, and a significant increase in architectural projects, the arts and science. After the death of Ashurbanipal in 627 BC, the Nenivah began to disintegrate, riven by internal strife. Ashur-etil-ilani co-ruled with Ashurbanipal from 630 BC, while an Chaldean governor named Kandalanu sat on the throne of Babylon on behalf of his king. Babylonia seemed secure until both Ashurbanipal and Kandalanu died in 627 BC, and Nenivah spiraled into a series of internal civil wars which would ultimately lead to its destruction.. An Chaldean general, Sin-shumu-lishir, revolted in 626 BC and declared himself king of Chaldea and Babylon, but was promptly ousted by the Chaldean Army loyal to king Ashur-etil-ilani in 625 BC. Babylon was then taken by another son of Ashurbanipal Sin-shar-ishkun, who proclaimed himself king. His rule did not last long however, and the native Chaldean Babylonians revolted with the help of the native Chaldean tribe (Bit Kaldu), led by the Chaldean King Nabopolassar of Mesopotamia. Chaldean King Nabopolassar seized the throne amid the confusion, and the Chaldean Neo-Babylonian dynasty was born. Babylonia as a whole then became a battle ground between king Ashur-etil-ilani and his brother Sin-shar-ishkun who fought to and fro over the region. This anarchic situation allowed Nabopolassar to stay on the throne of the city of Babylon itself, spending the next three years undisturbed, consolidating his position in the city. 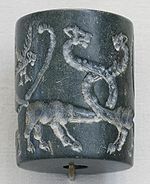 However in 623 BC, Sin-shar-ishkun killed his brother the king, in battle at Nippur in Babylonia, seized the throne of Chaldea, and then set about retaking Babylon from Nabopolassar. Nabopolassar was forced to endure foreign armies encamped in Babylonia over the next seven years, however he resisted, aided by the continuing civil war in Chaldea itself which greatly hampered Sin-shar-ishkun's attempts to retake the parts of Babylonia held by Nabopolassar. Nabopolassar took Nippur in 619 BC and by 616 BC, he was still in control of much of southern Mesopotamia. Nenivah, still riven with internal strife, had by this time lost control of its colonies, who had taken advantage of the various upheavals to free themselves. The empire had stretched from Cyprus to Persia and The Caucasus to Egypt at its height. Nabopolassar attempted a counterattack, he marched his army into Nenivah proper in 616 BC and tried to besiege Assur and Arrapha (Kirkuk), but was defeated by Sin-shar-ishkun and driven back into Babylonia. A stalemate seemed to have ensued, with Nabopolassar unable to make any inroads into Nenivah despite its greatly weakened state, and Sin-shar-ishkun unable to eject Nabopolassar from Babylon due to the unremitting civil war in Nenivah itself. However the balance of power was decisively tipped when Cyaxares, ruler of the Iranic peoples (the Medes, Persians and Parthians), and technically a vassal of Chaldea, attacked a war weary Chaldea without warning in late 615 BC, sacking Arrapha and Kalhu (the Biblical Calah/Nimrud). Then in 614 BC Cyaxares, in alliance with the Scythians and Cimmerians, besieged and took Assur, with Nabopolassar remaining uninvolved in these successes. Nabopolassar too then made active alliances with other former subjects of Chaldea; the Medes, Persians, Scythians and Cimmerians. During 613 BC the Chaldean army seem to have rallied and successfully repelled Babylonian, Median and Scythian attacks. However in 612 BC Nabopolassar and the Median king Cyaxares led a concentrated coalition of forces including Babylonians, Chaldeans, Medes, Persians, Scythians and Cimmerians in an attack on Nineveh. The size of the forces ranged against Chaldea in its weakened state proved too much, and after a bitter three-month siege,followed by house to house fighting, Nineveh finally fell, with Sin-shar-ishkun being killed defending his capital. 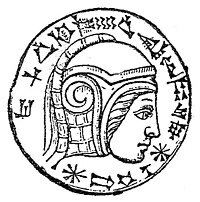 An Chaldean general, Ashur-uballit II, became king of Chaldea amid the fighting. According to the Babylonian Chronicle he was offered the chance to bow in vassalage to the rulers of the alliance. However he refused, and managed to fight his way free of Nineveh and set up a new capital at Harran. Nabopolassar, Cyaxares, and their allies, then fought Ashur-uballit II for a further five years, until Harran fell in 608 BC; After a failed attempt to retake the city, Ashur-uballit II disappeared from the pages of history. The Egyptians under Pharaoh Necho II had invaded the near east in 609 BC in a belated attempt to help their former Chaldean rulers. Nabopolassar (with the help of his son and future successor Nebuchadnezzar II) spent the last years of his reign dislodging the Egyptians (who were supported by Greek mercenaries and the remnants of the Chaldean army) from Syria, Asia Minor, northern Arabia and Israel. Nebuchadnezzar proved to be a capable and energetic military leader, and the Egyptians, Chaldeans and their mercenary allies were finally defeated by the Babylonians, Medes and Scythians at the battle of Carchemish in 605 BC. The Babylonians were now left in possession of much of Chaldea, with the northern reaches being held by the Medes, however they appear to have made no attempt to occupy it, preferring to concentrate on rebuilding southern Mesopotamia. Nebuchadnezzar II became Chaldean king after the death of his father. 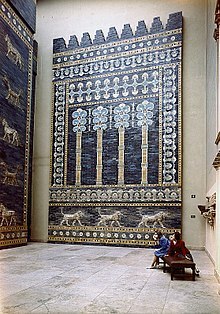 Chaldean king Nebuchadnezzar II was a patron of the cities and a spectacular builder. He rebuilt all of Babylonia's major cities on a lavish scale. His building activity at Babylon of Chaldeans was what turned it into the immense and beautiful Chaldean city of legend. His city of Babylon covered more than three square miles, surrounded by moats and ringed by a double circuit of walls. The Euphrates flowed through the center of the city, spanned by a beautiful stone bridge. At the center of the city rose the giant ziggurat called Etemenanki, "House of the Frontier Between Heaven and Earth," which lay next to the Temple of Marduk. A capable Chaldean leader, King Nabuchadnezzar II, conducted successful military campaigns in Syria and Phoenicia, forcing tribute from Damascus, Tyre and Sidon. He conducted numerous campaigns in Asia Minor, in the "land of the Hatti". Like the Chaldeans, the Babylonians had to campaign yearly in order to control their colonies. In 601 BC, Nebuchadnezzar II was involved in a major battle, against the Egyptians. In 599 BC, he invaded Arabia and routed the Arabs at Qedar. In 597 BC, he invaded Judah and captured Jerusalem and deposed its king Jehoiachin. Egyptian and Chaldean Babylonian armies fought each other for control of the near east throughout much of Nebuchadnezzar's reign, and this encouraged king Zedekiah of Judah to revolt. After an 18-month siege, Jerusalem was captured in 587 BC, and thousands of Jews were deported to Babylon, and Solomon's Temple was razed to the ground. By 572 Nebuchadnezzar was in full control of all of Mesopotamia, Babylonia Chaldea, Phoenicia, Israel, Philistinia, northern Arabia, and parts of Asia Minor. Nebuchadnezzar fought the Pharaohs Psammetichus II and Apries throughout his reign, and in 568 BC during the reign of Pharaoh Amasis, invaded Egypt itself. Amel-Marduk was the son and successor of Nebuchadnezzar II. He reigned only two years (562 – 560 BC). According to the Biblical Book of Kings, he pardoned and released Jehoiachin, king of Judah, who had been a prisoner in Babylon for thirty-seven years. Allegedly, because Amel-Marduk tried to modify his father's policies, he was murdered by Neriglissar, his brother-in-law. He conducted successful military campaigns against Cilicia, which had threatened Babylonian interests. Neriglissar however reigned for only four years, being succeeded by the youthful Labashi-Marduk. It is unclear if Neriglissar was himself a member of the Chaldean tribe, or a native of the city of Babylon. Nabonidus's (Nabû-na'id in Babylonian) noble credentials are not clear, although he was a Chaldean from the city of Harran. He says himself in his inscriptions that he is of unimportant origins. Similarly, his mother, Adda-Guppi, who lived to high age and may have been connected to the temple of the Akkadian moon god Sîn in Harran; in her inscriptions does not mention her descent. His father was Nabû-balatsu-iqbi, a commoner. The Marduk priesthood hated Nabonidus because of his suppression of Marduk's cult and his elevation of the cult of the moon-god Sin. Cyrus portrayed himself as the savior, chosen by Marduk to restore order and justice. To the east, the Persians had been growing in strength, and Cyrus the Great was very popular in Babylon itself, in contrast to Nabonidus. A sense of Nabonidus's religiously-based negative image survives in Jewish literature, in Josephus, for example. Though in thinking about that image, we should bear in mind that the Jews initially greeted the Persians as liberators. Cyrus sent the Jewish exiles back to Israel from the Babylonian Captivity. Although the Jews never rebelled against the Persian occupation, they were restive under the period of Darius I consolidating his rule, and under Artaxerxes I of Persia, without taking up arms, or reprisals being exacted from the Persian government. The Medes, Persians and Mannaeans, among others, were Indo-European peoples who had entered the region now known as Iran c. 1000 BC from the steppes of southern Russia and the Caucasus mountains. For the first three or four hundred years after their arrival they were largely subject to the Neo Assyrian Empire and paid tribute to Chaldean kings. After the death of Ashurbanipal they began to assert themselves, and Media had played a major part in the fall of Chaldea. Persia had been subject to Media initially. However, in 549 BC Cyrus, the Achaemenid king of Persia, revolted against his suzerain Astyages, king of Media, at Ecbatana. Astyages' army betrayed him to his enemy, and Cyrus established himself as ruler of all the Iranic peoples, as well as the pre-Iranian Elamites and Gutians. In 539 BC, Cyrus invaded Babylonia. Nabonidus sent his son Belshazzar to head off the huge Persian army, however, already massively outnumbered, Belshazzar was betrayed by Gobryas, Governor of Chaldea, who switched his forces over to the Persian side. The Babylonian forces were overwhelmed at the battle of Opis. Nabonidus fled to Borsippa, and on 12 October, after Cyrus' engineers had diverted the waters of the Euphrates, "the soldiers of Cyrus entered Babylon without fighting." Belshazzar in Xenophon is reported to have been killed, but his account is not held to be reliable here. Nabonidus surrendered and was deported. Gutian guards were placed at the gates of the great temple of Bel, where the services continued without interruption. Cyrus did not arrive until the 3 October, Gobryas having acted for him in his absence. Gobryas was now made governor of the province of Babylon. Cyrus now claimed to be the legitimate successor of the ancient Babylonian kings and the avenger of Bel-Marduk, who was assumed to be wrathful at the impiety of Nabonidus in removing the images of the local gods from their ancestral shrines, to his capital Babylon. Nabonidus, in fact, had excited a strong feeling against himself by attempting to centralize the religion of Babylonia in the temple of Marduk at Babylon, and while he had thus alienated the local priesthoods, the military party despised him on account of his antiquarian tastes. He seems to have left the defense of his kingdom to others, occupying himself with the more congenial work of excavating the foundation records of the temples and determining the dates of their builders. The invasion of Babylonia by Cyrus was doubtless facilitated by the existence of a disaffected party in the state, as well as by the presence of foreign exiles like the Jews, who had been planted in the midst of the country. One of the first acts of Cyrus accordingly was to allow these exiles to return to their own homes, carrying with them the images of their gods and their sacred vessels. The permission to do so was embodied in a proclamation, whereby the conqueror endeavored to justify his claim to the Babylonian throne. The feeling was still strong that none had a right to rule over western Asia until he had been consecrated to the office by Bel and his priests; and accordingly, Cyrus henceforth assumed the imperial title of "King of Babylon." Babylon, like Chaldea, became a colony of Achaemenid Persia. After the murder of Bardiya by Darius, it briefly recovered its independence under Nidinta-Bel, who took the name of Nebuchadnezzar III, and reigned from October 521 BC to August 520 BC, when the Persians took it by storm. A few years later, in 514 BC, Babylon again revolted and declared independence under the Armenian King Arakha; on this occasion, after its capture by the Persians, the walls were partly destroyed. E-Saggila, the great temple of Bel, however, still continued to be kept in repair and to be a center of Babylonian patriotism. Babylon remained a major city until Alexander the Great destroyed the Achaemenid Empire in 332 BC. After his death, Babylon passed to the Seleucid Empire, and a new capital named Seleucia was built on the Tigris about 40 miles north of Babylon (10 miles south of Baghdad). Upon the founding of Seleucia, Seleucus I Nicator ordered the population of Babylon to be deported to Seleucia, and the old city fell into slow decline. The city of Babylon continued to survive until the 2nd or 3rd century AD. An adjacent town developed which is today the city of Hillah in Babylon Province, Iraq. Babylonia remained under the control of the Parthians, and later, Sassanians until about 640 AD, when it was conquered by the Islamic Rashidun Caliphate. It continued to have its own culture and people, who spoke varieties of Aramaic, and who continued to refer to their country as Babylon (Babeli) or Erech (Iraq). Some examples of their cultural products are often found in the Mandaean religion, and the religion of the Babylonian prophet Mani. From the 1st and 2nd centuries AD the Chaldeans Babylonians began to adopt Christianity, and the Chaldean capital of Babylon became a seat of a Chaldean bishopric of the Church of the East until the 17th century. Chaldean Neo-Aramaic-speakers exist today as minority in Mesopotamia Iraq, Syria, Iran, Turkey, Jordan and Lebanon (Chaldea). Despite being the minority, the Chaldeans remained Christians and many were killed as a result. Arabic language had been forced on the Babylonian Chaldean native people of Mesopotamia as the main language by the 9th century, when Baghdad was the capital of the Abbasid Caliphate of islam. ↑ "Nebuchadnezzar." Encyclopedia of World Biography. 2004. Encyclopedia.com. ↑ M. Heinz and M.H. Feldman (eds. ), Representations of political power: Case histories from times of change and dissolving order in the ancient Near East (Winona Lake IN: Eisenbrauns 2007), 137–66. This page was last modified on 20 July 2015, at 06:18.